Almost the widest speedboards ever made. At this moment I only could think of one wider speedboard made in the past, the carbon art speed 60, however this small brand didn't caused a new trend. 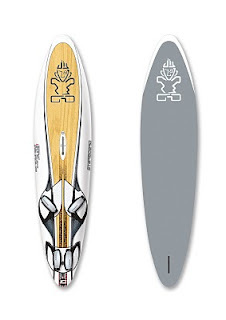 Will this new starboard set a new higher standard for lightwinds/ heavyweights, a new era for speedsurfing?? I had to find more information!!! Low wind, below 18kn of wind regular speedboards are not handy even for me with 80kg bodyweight. Beginning speedsurfers, the small speedboards give to less rider feedback for beginning speedsurfers. A bigger board gives more rider feedback. I contacted the dutch importer of starboard www.fox-sports.nl, really fast Martijn Vos replied, he happens to be a fast speedsurfer and was willing to answer my questions. This short interview is about if starboard succeeded to build a speedboard suitable for lowwind or heavyweights or beginners or maybe all?? Is this starboard isonic speed special 58 made for a specific goal/group? heavyweights or lightwinds/ beginners? The new 58cm wide model works out really for heavyweights, lightwinds and beginners. I have tested together with Jurjen van den Noord this board twice last year and we were both very impressed about the speed. You can sail this board with very big sails without any problems, plus the volume in the front does make it much easier to float in windgaps. Rough conditions work out great with the isonic speedspecial 58, it start to really fly over chop. An allround sportive stationwagen can't beat a pure F1 racing car, does this also apply on the new speed special? Which starboard dreamteam member did mainly developed this speed special 58? Tiesda You and Remi Villa made several proto's, in the end we chose for Remi Villa his design. The shapes of Tiesda were a bit to much near a slalomboard. But Remi his design was 100% speed with a superb acceleration. Furthermore many international testers tried the board before production. Do you have some numbers?? How many knots did the speed special already, I suppose it has been tested before production? I don't have any numbers yet, but I think next season the board will show its potential. It will be the ideal board for most USM competition (ultimate speed meeting). Did you found some differences between the smaller speed special boards and this new 58cm wide one? The shape is based on the Isonic speed special W53, the rails are changed to a more straight design. To give that extra lowwind performance boost. I would like to thank Martijn for answering these questions. I am very curious what this board will bring in the future, it could be that the slalomboards will be not able to compete against a 100% speeddesign. Definitly a board to watch out for! This will be the ultimate test for slalomboard vs speedboard design, can't wait to see some results. This was very interesting for me, as I have the W44 and W53. I am thinking about changing my SB Sonic 100 for the W58 for 7m and 8m light wind days, but not sure if it will be much different from my W53. There is very little details on the W58. If you find out more details, please post updates. Yesterday i got the W58. It looks very very nice. Somewhat like his smaller, but also very fast, brother the W53. As soon as the ice is gone i let you know how it sails. On the starboard website there is some info about this board. Did you get a chance to try the W58 as yet? How is it working compaired to slalom? Yes i've sailed it twice now. Once in medium chop and once on flat water, both in combination with a 7.0. The board can cope with chop very easy, even better then the W53 i think. Compared to the slalom (Isonic 94), I think it has a slightly smaller windrange, and it's a bit harder to go upwind. Half wind it's as fast and downwind it's absolutly faster. Sailed the board with 29/31/33 cm speed fins. 31 was best I think. Thanks Jurjen. Looks like I'll be swapping my old Sonic 100 for a W58:) I was a bit concerned that the W58 would be to close to my W53. Do you have the W53 as well and do they overlap each other a lot? Just a thought, but wonder if it would be possible to upload pictures of the W58 onto this site? ?